After taking a one-year break from the Assassin’s Creed series, Ubisoft shakes things up in the known formula. Is Origins truly a revolution? Let’s try to formulate an opionion based on 4 hours we spent in its open world. the origins of the Assassin Brotherhood. It’s been amost 10 years since the release of the first Assassin’s Creed game. In the meantime, we’ve visited the Middle East and Rennaissance Italy, witnessed the birth of the United States, and then upheld order and balance in Victorian London. The changes that will be introduced in less than a month with the release of Origins will be the bravest step taken by Ubisoft in the last decade. During the London presentation I’ve spent almost 4 hours with the soon-to-be latest installment of the AC franchise, and while I’m far from forming my final verdict about the game, one thing is certain in my mind: Assassin’s Creed Origins is a clever mix of revolutionary innovations and a ton of the series’ well-known solutions. 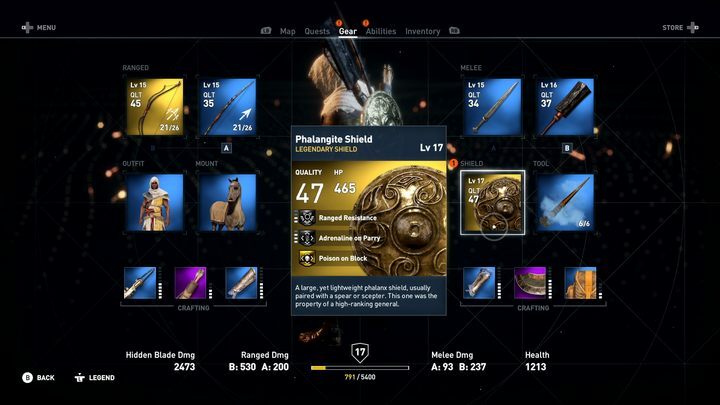 If you’ve read what we’ve already written about the game, or watched the promo materials released by the publisher, you’re perfectly aware of what the most essential changes introduced in Origins are: a living, open world and completely refurbished combat, equipment, and character progression mechanics. In other words, the aim with the latest title in the Assassin’s Creed universe is to make it a typical modern action RPG; an experiment which I find succesful, even if most of the solutions it features were borrowed from competition. 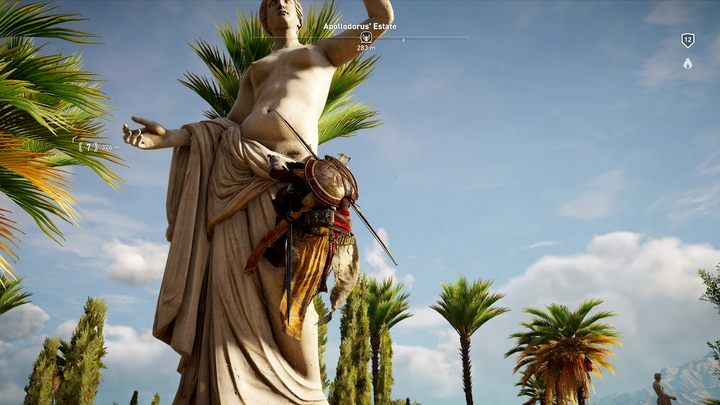 I couldn’t resist the impression that the open world in Origins was deliberately made into a combination of the sheer scale of exploration from Skyrim and the plethora of side quests from Wild Hunt, all of it served in a way that makes one remember Black Flag – and for a good reason. This means that the game is both vast and filled with activities. Some of them are marked on the map with relevant icons, but I would often stumble upon something to do randomly, on my way to a marker. All of the above is sprinkled with procedurally generated events, such as chariot chases between two factions armed with bows, just waiting for us to meddle with. If it’s Egypt, then should I go to Sharm el Sheikh or Hurghada? While I wouldn’t call it a novel approach to video game design – believe me, the comparisons to the latest Elders Scrolls and The Witcher 3 are there for a good reason – it certainly is a significant change for the franchise. Across the 4 hours I’ve spent with the game, I’ve never found myself feeling like I was repeating things, which was something that plagued the previous Assassin’s Creed games to a significant degree. The good thing is that most of the side activities have been backed up with a narrative background; some of them can even be considered small-scale questlines rather than unrelated stand-alone errands, enabling us to connect with some of the random NPCs. The fillers are still there, obviously – such as areas with ruined villages, where we have to look for random treasures; we also have animal lairs, featuring nothing more than a few typical representatives of the species and a single “mini-boss”. If the later parts of the game maintain a certain level, the saturation of the game world with activities should be counted among the games assets. More and more games offer some sort of automated travel system. 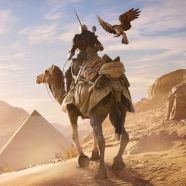 If you don’t want to use fast travel in Origins, you will be able to mount a horse or a camel. The new Assassin’s Creed allows you to automatically navigate to the nearest map marker by holding the proper key for a few seconds (instead of holding it the whole time, as for example in The Witcher 3). I hope that this element will get some more polish before the game is released – my horse would sometimes choose weird paths to the target, or get stuck on elements of the environment. What needs to be considered a revolution in the franchise is the new combat system, which no longer requires us to rely on counters and route our enemies into a line of people waiting to be one-shotted. What’s interesting, the system has seen some further improvements since its E3 presentation, all thanks to the feedback from gamers and journalists who had the chance to play the game. Ashraf Ismail, the game’s director, admitted that people used to the previous combat system need about two hours to switch to the new system and become comfortable with it, something which I can confirm from my very own experience. There are several factors contributting to this: the rules of combat have changed, the key bindings on the controller have changed, the fact that we need to react to the actions our enemies take, and the fact that there are differences in how some of the weapons handle in combat. For now, I’ll focus mostly on the last aspect. 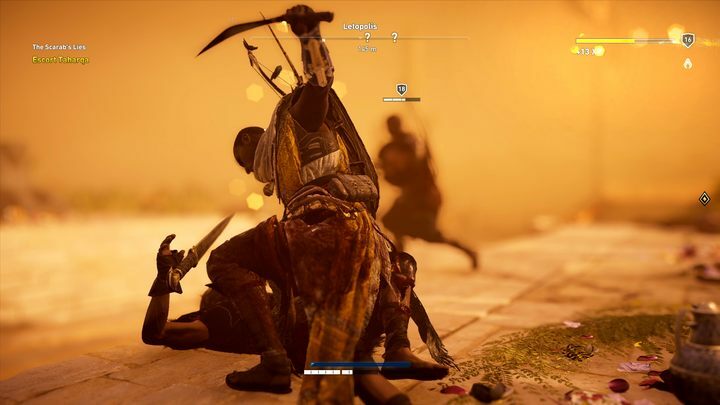 Since E3, we’ve heard many times about the option to switch to the old combat system in Origins. It seems there has been a minor misunderstanding, because the upcoming game won’t feature the old system, which was based on counterattacks. When asked about this, Ismail told me that what they meant was only preserving the old control scheme as an alternative, since it had to be significantly modified for Origins. Don’t ask me why I chose to climb this monument. It came in handy. Origins offers seven types of melee weapons, each of which is characterized by three stats: damage, range, and speed. The game gives us two melee weapon slots, which we can switch during combat (same with bows). While it matters little during the common, run-of-the-mill skirmishes, the battles we will face during the main storyline are much less forgiving when it comes to bringing the wrong knife to a bowfight. It’s good to first use the skills of our flying companion, the eagle Senu, to have an idea as to what, or rather who, we are up against, and choose a suitable set of equipment. The sword + shield combo is a rather universal set, enabling us to deal with most enemies. In some situations, a different weapon may be preferred – when being surrounded, take the spear and use its impressive area damage; when battling slow, resilient foes bet on the speed offered by a pair of swift blades. At the same time, this can backfire from time to time – in one of the battles I had to face a powerful enemy armed with a shield, so naturally I took a heavy blunt weapon to deal with him faster. Unfortunately, my weapons of choice turned out to be too slow, staggering the enemy on the first hit, but being too slow to land a second one before he regained his composure. 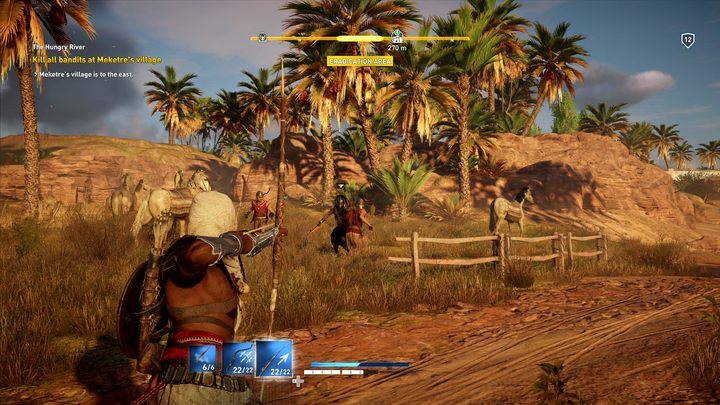 While the veterans of the franchise will have to get used to this new weapons handling, it is a step forward that introduces a whole new tactical layer to Assassin’s Creed combat. Bird’s eye view has a very literal meaning in this game. The way you attack when your adrenaline bar is full looks impressive. Speaking of equipment, let me take a moment to inspect the character screen interface, which I wasn’t too keen on. It’s obvious that the developers of Origins have modelled their interface after the solutions adopted in e.g. Destiny, offering clarity and easy access to the equipment screen. In the new AC, however, they’ve got only half of it right – the weapon screen is spacious and has a simple idea behind it, but to change an item in any of the equipment slots, you’ll need to open up a separate window. This becomes a major nuisance when it comes to selecting a weapon, as they are devided into several types, which makes for a rather long list to browse – especially if you like to have backup weapons to counter unforseen surprizes. The character progression screen is equally convoluted, and you’ll spend a lot of time before you decide where to invest any of your skill points. The skill tree layout, highly unintuitive in my opinion, doesn’t help either. Perhaps the reception of this particular element will be different once we begin our adventure with it, but in my situation, when I allocated points while having 2/3 of the character’s skillset unlocked at once, it took me a long time before I was able to make any decision. One of the most important characters of this game’s plot will be Cleopatra – she will be striving to reclaim the control over the nation after being exiled by her younger brother, Ptolemy XIII. The whole thing was of course a scheme of the Order of the Ancients, who are basically the proto-Templars. I’m really curious to see how her story ends, because, according to the information from previous installments, Cleopatra was killed by a female assassin named Amunet (or by her viper, to be more precise). Egypt, and especially Ancient Egypt, was a setting that, for the dev team – and for me, personally – has always made sense for AC. Ever since the first game, I felt like, at some point, this series needed to go to there. But there was always a technical challenge in that (...). Egypt is not a city; it’s a countryside, there’s a lot of diversity in the environment – (after Black Flag – the team’s last game – ed. note) we felt that we’ve learned enough that we can actually make that stuff (...). It was also constantly in the top-three of the requested settings. (...) We felt that we had to really bring Egypt to life; we didn’t want to load into cities; we wanted a seamless and continuous world. We didn’t necessarily want something like AC1, a hub-world. (There was a bit of a debate concerning the exact time period – ed. note), but we wanted an Egypt that was already filled with great cities and mysteries; that’s why we settled on Cleopatra and Caesar – it felt like it was the end of old world, an epic time and a cool setting for us to show something that’s important for the series. I am hereby happy to declare that this is one of the most appealing settings the series has seen so far. The world looks amazing and there’s much more to see than just the pyramids. 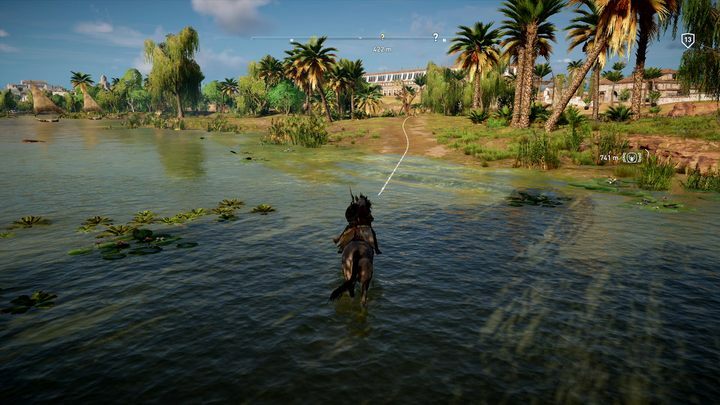 You can really tell that the developers have long and thoroughly studied the geography and architecture of Ancient Egypt – thanks to which we get a world that’s as magical as we wished it would be. 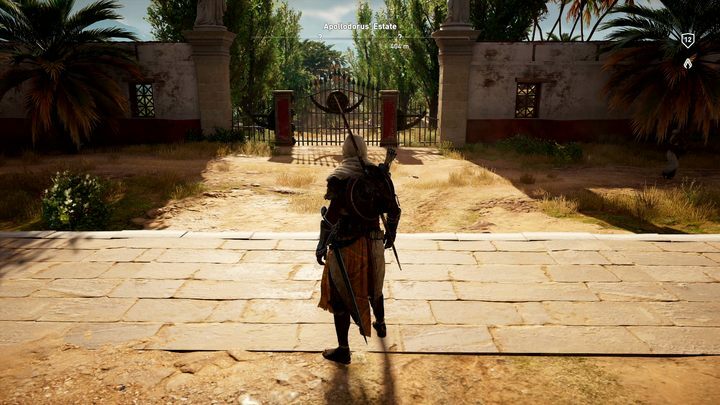 Is this Bayek or Oliver Queen? The veterans of the series will surely cherish the comeback of the classic rituals associated with the brotherhood; even though the subsequent entries in the series were increasingly advanced in technical terms, none of the follow-ups managed to match the masterful world creation and the consistency of the setting known from the original Assassin’s Creed. If you agree with this statement, then rest assured: Origins is a very satisfying nostalgia trip. The fragment of the game I played through consisted of a main quest line that ended with an assassination. Finishing this thread took me some 90 minutes, and during the session I was able to do a bit of sneaking and a bit of sword fighting; there were also some special elements, which I shall omit in order to spare you the spoilers. Finishing the mission took me to a conversation within the Animus’ virtual reality, just like during Altair’s heyday, and the assassination was concluded with staining an eagle’s feather in the victim’s blood, which is a direct reference to the future practices of the brotherhood that we’ve already seen in the original AC. Ashraf Ismail assured me that the game is full of such allusions, because he and his team wanted to present Bayek’s personal story in paralell with the story of the brotherhood’s genesis. And that obviously imposes the presence of many minor details that we associate with Altair and his gang. In 300 yards take a right turn. However, there are certain solutions that I’m not particularly keen on – there’s the equipment screen, for instance, which I find pretty inconvenient. Some dialogues seemed like they were taken from a B-class movie – they are oftentimes pretty dreary and some of the jokes seem rather out-of-place and hence unconvincing. When the dialogues are too bombastic, you can clearly feel it, too. Fortunately, that doesn’t happen all the time – the majority of the conversations flow naturally and fit the characters well. The veterans might have a hard time getting over the hidden blade’s efficiency – because the game utilizes a much more RPG-like damage system, some of the assassinations are not really assassinations – if the level difference between the target and the player is too great, the hidden blade backstab doesn’t instantly kill the enemy. The crafting system is also too simple – you can just upgrade one of the six elements of the protagonist’s inventory, increasing stats such as the amount of health or the damage of individual weapons. I don’t mind how frequent the legendary items drop. The one-year gap between big installments of the series was definitely a good idea: it allowed the dev team to introduce big changes, which the previous games obviously needed, but could not attain due to hectic schedule. Is this a revolution? In a broader context – it’s certainly not. 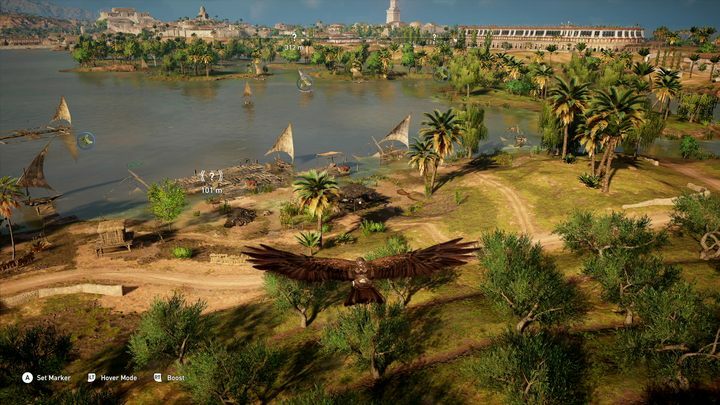 But for the flagship Ubisoft series, Origins is a leap (of faith) forward. While it’s not really a genre-defining landmark (side note: isn’t this Ubi’s own genre? ), the game is definitely worth giving a try. This year’s Assassin’s Creed offers a really big, open and living world and a combat system that’s finally at least a little bit challenging. And then, there’s the setting – wasn’t Ancient Egypt what we wanted all along? I have been a fan of the Assassin’s Creed series ever since the first game came out. The unique world and original idea for gameplay captivated me despite the repetitive mechanics. Of all the installments of this series, my warmest feelings go to the Ezio trilogy (Brotherhood!) and the original game, which was the only entry really focused on making sure the game world was fully coherent with the plot. The London presentation was the first time I was able to play Origins myself.